Market research has evolved in the previous years. Before the personal computers, smartphones, and internet invented, there were pen-and-paper surveys. It sounds like old times, but it was the reality until the 1960s-70s. After CATI (Computer-Assisted Telephone Interviewing) came in, researchers started using it since it was more cost-effective, and efficient due to the instant access, and targeting options. After the computer revolution, CASI (Computer-Assisted Self Interviewing) and CAPI (Computer-Assisted Personal Interviewing) came in, where participants and interviewers were using computers to ask/answer questions. Even though all these options were useful, they were not accessible or scalable from a broad perspective due to its need for manual inputs. Then, with the internet revolution, online market research started growing, followed by mobile market research with the smartphone revolution. Both methodologies allowed researchers to collect insights from consumers in an effective and an efficient way. But, what are the main factors that differentiate these methodologies from each other? 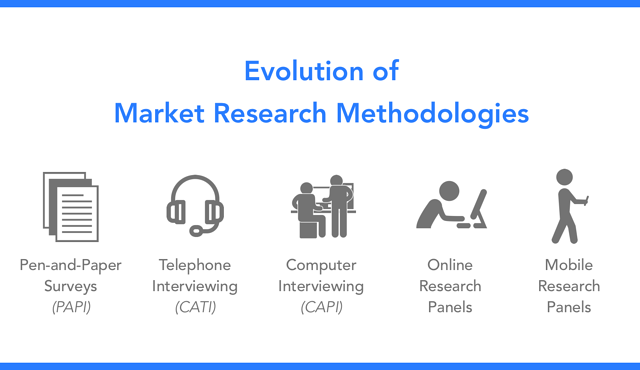 What are mobile and online market research methodologies? Online market research is a research methodology that connects businesses with consumers via websites. Imagine consumers who are members of an online panel, where they receive an email each time there is a new research study they can attend to, and share their answers on their web browser. Mobile market research is a research methodology that connects businesses with consumers via smartphones. Imagine consumers who have the mobile market research app installed on their smartphones, where they receive a push notification each time there is a new research study they can attend to, and share their answers on their smartphones. Both these methodologies are superior to traditional methods due to their scale, provided organic user experience and data validation mechanisms. But, how do they compete with each other? 1. Online is reliable; mobile is more reliable. Due to the background data of each user on the platform, online and mobile platforms are reliable. However, since mobile market research platforms provide instant photo/video capturing ability and extends answers with location data, mobile market research platforms are more reliable. 2. Mobile is in-the-moment, on-the-ground. One of the most critical things in market research is asking questions to consumers/shoppers at the right time, in the right place. Since smartphones are always with consumers/shoppers and provide location data, mobile market research platforms can collect data from the right audience, at the right time, in the right place. There is no latency between the experience and submission. 3. Duplication control is smarter on mobile. User duplication is one of the weakest areas of online and mobile market research methodologies. Online platforms prevent user duplication fraud via 2-factor authentication. Along with 2-FA, mobile platforms also can identify devices to identify users with duplication. 4. Behavior extends mobile’s reach. 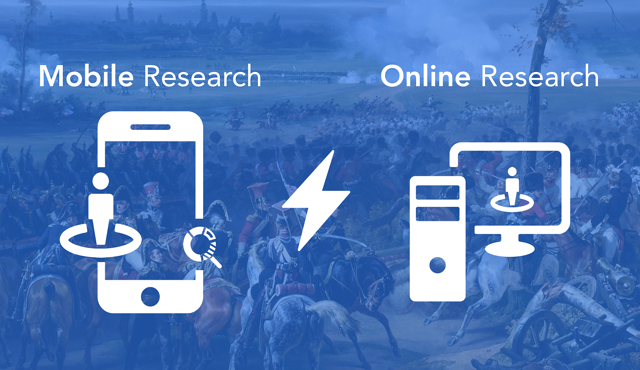 Online research is not real-time, but people share their experience after the experience is over, and some time passed. Mobile, on the other hand, can trigger research to audience according to their behavior (location, shopping) which allows mobile to have data with a higher-quality, and richer. 5. Mobile push notifications beat email at engagement. Email open rates are between ~20% to ~25% and click rates are ~2.75%. On the other hand, the average opt-in rate in mobile for push notifications is ~35%, and click rates are ~10%. Email is not real-time, but mobile push notifications is real-time, and if designed contextually, their conversion rates are higher; which allows mobile market research platforms to engage with a higher percentage of consumers. 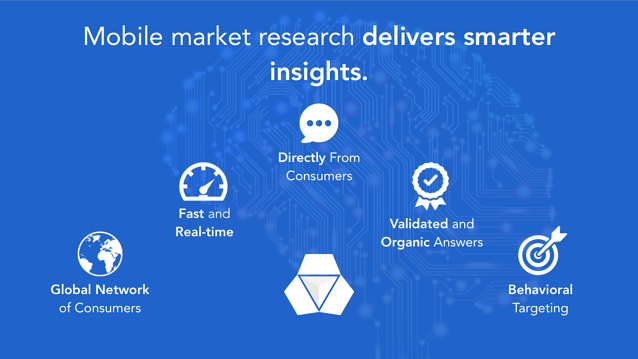 Mobile market research delivers smarter insights. Quality of the answers increases when the relevancy of studies increase with the target audience. Mobile market research platforms deliver relevant studies with consumers/shoppers, at the right time, in the right place. Combining this relevancy with smart communications, and data validation methods, mobile market research is being superior to other types of market research techniques at quantitative market research, and some areas of qualitative market research. If you want to conduct mobile market research studies and learn more about how mobile market research works, go to www.twentify.com, and check our solutions and methodology. If you want to go further and learn more about the details, send us a message.